Low back pain is a common complaint these days. Most people work at an office or are spending much of their day sitting. 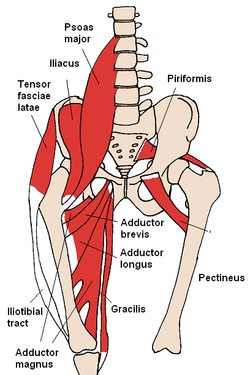 This tightens hip flexor muscles (ilopsoas which consists of the Iliacus and Psoas muscles) and can lead to low back tension. One way to help combat low back tension is to strengthen the muscles that are deep to your “core”,”or the muscles that are closest to your actual spine. Low back injuries often restrict movement and lead to the weakening of low back muscles. Exercise balls are a great option for a gentle core-strengthening program that can stabilize the muscles surrounding the spine and help prevent future injury. One of the simplest ways to incorporate an exercise ball into your routine is just to practice sitting on it. Sitting on the ball activates the core muscles required to maintain balance. If you are having trouble balancing, deflate the ball a little for added stability. If your balance feels good, try replacing your office chair with an exercise ball or sitting on the ball while watching television. Besides working your core muscles, the ball also reduces stress on the spine. Many low back injuries occur as a result of improper lifting; squats that use an exercise ball for support (the exercise ball is placed against the wall behind the small of the back) train the back to retain proper posture and train the knees not to extend over the toes. The muscle action required to remain upright on the ball also helps in finding a neutral spine position, improving posture, increasing low back mobility, and developing overall strength and control of the core muscles—both back and abdominal. As with any exercise program, it is essential to consult your doctor or a licensed physical therapist before beginning.